Every day, our three-year-old finds new ways to throw the house into total mayhem. Oh, don’t get me wrong. I love it. She’s playing. It’s imaginative. It’s what all the books say you want. And it’s fantastic to watch that little brain at work. But it can be wildly dispiriting to contemplate putting it all away at the end. And even more dispiriting when there seems to be no end. MJ used to play at something for an hour or so, then grow bored and move on. That’s when I would swoop in, sing “Clean up!” and zip everything back into its place. Done. These days, though, one game can stretch on for days. And, from Myra-Jean’s perspective, at least, that means everything must stay where it is until she’s done playing. This can lead to, um, conflict. Last week, for example, MJ created a”spider’s nest” in her bedroom. It was a major set-up: several blankets, her entire collection of recently-made arachnids, a bunch of blocks, some toy trains, a handful of beads, colored feathers, stuffed animals…the list goes on. Every single element was, for her, indispensable and perfect. And it remained so, even when it was time for bed. This posed us with a dilemma. MJ’s bedroom is not large. I’ve seen bigger meat lockers. This game effectively took up every inch of walking space. Still, it was sweet. And so clever! We decided to let it go for the night. But the next day saw no diminishment in MJ’s zeal. If anything, the project grew more elaborate. “Why?” MJ asked, her voice quavering. “Fires, earthquakes, to start–” said Mike. “I want it to stay!” Instant tears. An actress would kill for such ability. So it stayed. Until day five, when I snapped. MJ was at school; I was cleaning, in that I’ve-only-got-two-hours-to-do-ten-hours-worth-of-housekeeping kind of way. Entering her room, I looked around. I weighed the consequences. And I cleaned. Everything. Up. Until later. When Myra-Jean saw what I’d done she cried like I’d killed her puppy. A really cute one, with lopsided ears and a black patch over one eye. Which brings me to tonight. And my living room. The game this week is “Spider Doctor.” It takes place not in MJ’s room, but out here, in our common area. The “set” for it makes last week’s play look like black box theater. We’re Broadway bound now! This game involves most or all of Myra-Jean’s possessions, and quite a few of ours. There are pillows covered with cloth napkins on the coffee table, an “examination area” blocking the TV, bins, baskets, play doctor tools, a cigar-box banjo, pots and pans, plastic bead necklaces, a measuring tape, Trader Joes bags…it’s an installation of epic proportions. Think “Les Mis,” with pipe cleaners. And tonight I can’t do it anymore. Like a Satanic stage hand, I am striking set before closing day. I need a break. I need a living room. I need to watch an episode of “Game of Thrones” without a pile of “spider food” blocking my view. I need to be a grownup, if even just for a couple of hours. Which will only be a partial lie. 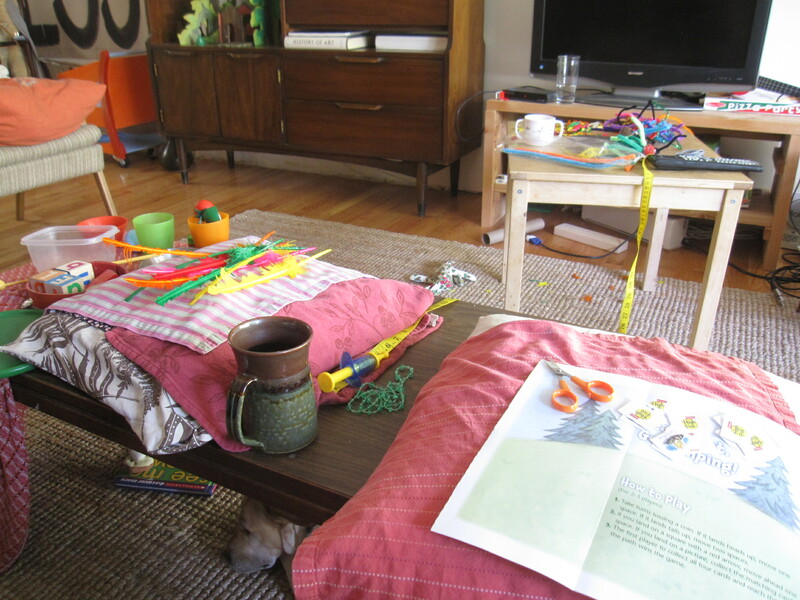 This entry was posted in childcare, cleaning and tagged imaginative play in children, kids playing doctor, messes kids make, playing doctor, spider crafts on May 5, 2013 by thumbstumbler. I can TOTALLY understand you wanting your house back and yet, part of me is so amazed with the fact that there is at least one child left in America with an attention span that lasts more than 30 seconds. I’m sure there are others, but I don’t know them. Certainly not my niece and nephew. She can keep working on a project for days? I can’t help but admire that a bit. That’s creativity. You’re kind. I think the no media thing may help, but I’m not sure. Could just be luck.